The upper part of these ECCO golf shoes is made of Yak leather which is extremely durable and water-resistant. Your legs will not get sweaty wearing these golf shoes as they are breathable. Rubberised circles on the insole can pull down your socks during an intense game. 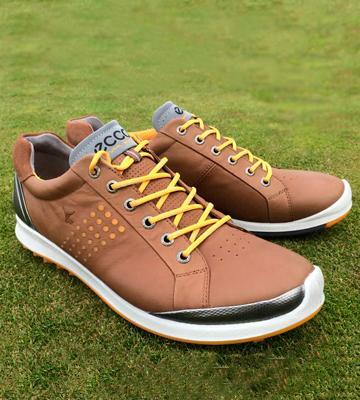 Thanks to the anatomic shape, these golf shoes from ECCO allow you to enjoy the whole match without feeling tired. Unparalleled grip thanks to 800 traction points. The CloudFoam sock liners ensure excellent cushioning when you walk, providing support to your heels and foot arches. The extra-durable Adiwear outsole provides good traction and does not tumble grass. Seude inserts are less wear-resistant than leather. You will never be disappointed with the quality of these Adidas golf shoes. Thanks to all the cutting-edge convenience features, you will enjoy every single moment of a golf round. The Rubber Stud system of these golf shoes delivers a soft ride and unparalleled traction. The price is really wallet-friendly. The material these shoes for golf are made of somewhat lacks breathability. 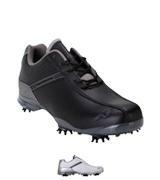 The Woodworm Surge golf shoes provide convenience while playing golf but they are also suitable for everyday wearing. These shoes do not require additional insoles as their neoprene insoles provide strong heel and foot arch support. 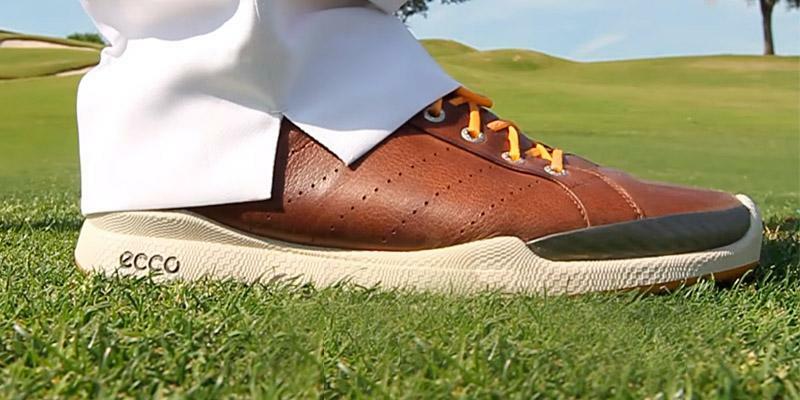 The material these golf shoes are made of is breathable. People with large feet might find the toes of these golf shoes slightly narrow. These Woodworm TEG golf shoes are created to make your game experience comfortable and pleasurable. The spikes on the soles are highly effective and create unmatching traction. The FusionFoam outsole is far more lightweight than conventional soles. Thanks to the Outlast® temperature control technology, your feet will always be in comfort. 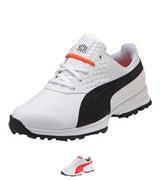 These Puma golf shoes might seem somewhat bulky but they are really lightweight. The upgraded TITANLITE golf shoes ensure a pleasurable golfing experience. 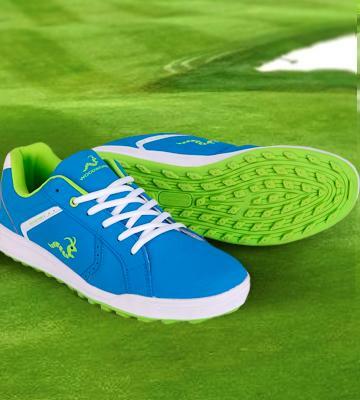 The Pula shoes for golf are suitable for players of any level! 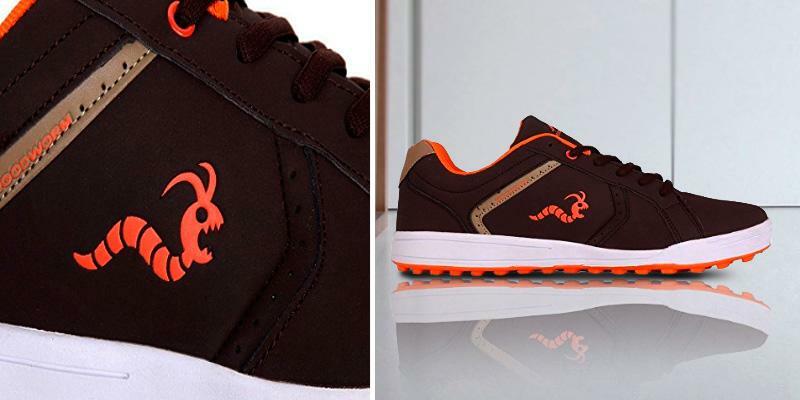 The main part of these ECCO golf shoes is made of natural Yak leather. It is known that this type of leather is softer and more durable than usual leather. Therefore, the wear-resistance of ECCO golf shoes is significantly higher than in those models which are mostly made of synthetic material. In addition, the anatomically shaped insole provides your shoes with excellent flexibility, which is very important while swinging. The ECCO Biom Hybrid 2 golf shoes have a fantastic double-layer sole that consists of two parts - a light one, solid and stiff, and a dark one, soft and ductile. 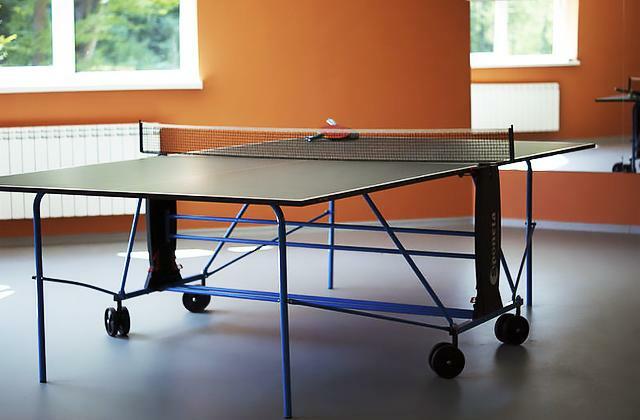 It also has spikes for enhanced stability and sturdiness. Wearing these ECCO golf shoes, you will feel confident wherever you are - be it a golf course or a catch-up with friends. Thanks to the Hydromax technology, the exterior material of the ECCO golf shoes will never let your feet get sweaty. Their anatomical shape feels comfortable no matter what shape of feet you have. The leather also does not harden up over time, so you can enjoy their softness and smoothness for years. These shoes feature innovative insoles with a circular pattern that provides a massaging effect on your feet. To make a fantastic swing that might lead you to victory, not only do you need to be a skilled golf player but you should also wear a good quality pair of shoes. A golf course has a grassy terrain, so you're likely to slip and possibly fall when making your hits. Therefore, playing in shoes with anti-skid soles is a big part of success. 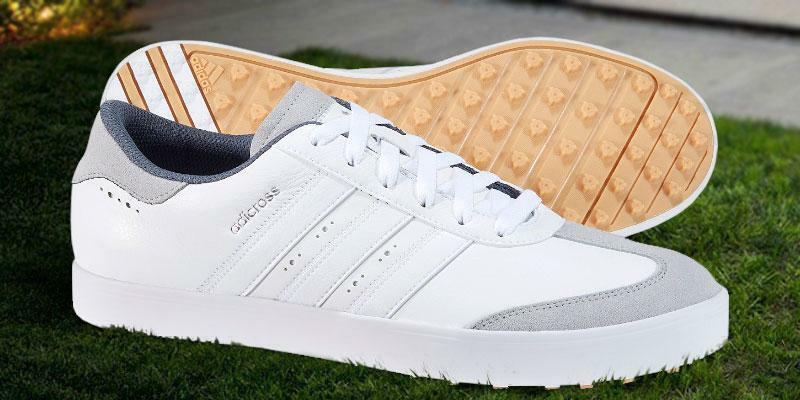 Among scores of available golf shoes on the market, many avid golfers choose to buy the Adidas Adicross V golf shoes. The shoes are made of high-quality ClimaStorm® leather with suede inserts. The leather makes these shoes water-resistant, soft, and extremely comfortable to wear. 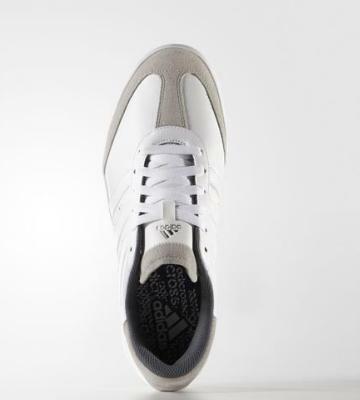 The Adidas golf shoes are lightweight and breathable, which means your feet will not get sweaty even on hot sunny days. The heel area of the sockliner has a special EVA cushioning for extra comfort. The shape of these shoes provides an outstanding heel and foot arch support, so you can enjoy the whole game without feeling fatigue. We would like to mention that these golf shoes do not need any additional insoles or instep raisers. As for the sole, these Adidas golf shoes have a flexible Adiwear™ spikeless outsole with 72 lugs that are strategically placed in order to provide the unmatching traction and be green-friendy at the same time. 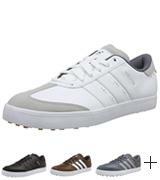 If you wish to enjoy playing golf on UK's best courses, these Adidas shoes will never let you down! Golf players need to have a lot of accessories at hand. To carry and store this stuff properly, consider using a handy golf bag. The Surge V2.0 are laced men's golf shoes created by Woodworm company. It is an upgraded version of the previous-generation shoes. This pair of golf shoes is notable for its eye-catching design and innovative technologies used, allowing golf players to play with more comfort, keeping their feet dry. According to the owners, these shoes are also incredibly lightweight and wearing them doesn't feel uncomfortable at all. 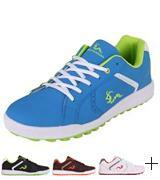 The upper part of these shoes is made of synthetic leather with the Golf-Tex membrane. This material is totally waterproof, so your feet will not get wet even if a downpour catches you right in the middle of a golf course. The sole is made of rubber and has no large spikes, providing amazing traction on grass and keeping a player from slipping on it. 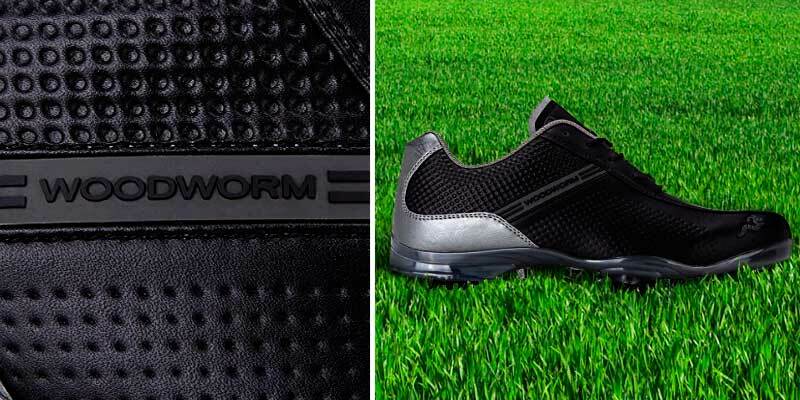 Just like on other golf shoes, the sole on these Woodworm Surge V2.0 is lawn-friendly. In all, these golf shoes combine comfort, light weight, and quite a moderate price. 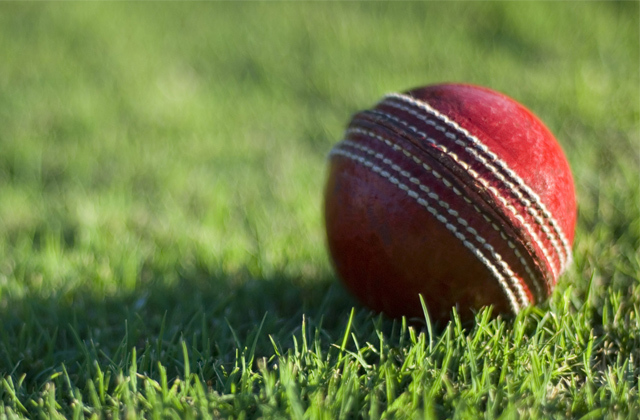 Playing golf is impossible without special golf balls, so do not forget to get them in advance. For more than 10 years Woodworm has been producing high-quality golf equipment and outfit. The golf shoes manufactured by the company are known for being highly convenient, durable, and full of innovative technologies used. The shoes are made of synthetic leather which fully protects your feet from water and moisture. The stitches on these golf shoes look quite reliable and backed with a Dingtex membrane for the ultimate protection. Being waterproof, these golf shoes are breathable, which means your feet will not get soaking wet after a couple of hours playing golf. Walking is comfortable if you are wearing these shoes as they have a neoprene insole ensuring fantastic heel and foot arch support. We would also like to draw your attention to the tongue of the Woodworm golf shoes; it has a well-though-out shape and is very soft. 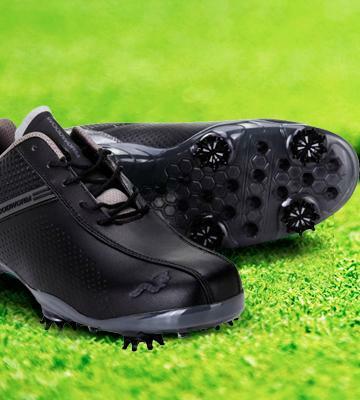 As for traction, a single look at these golf shoes is enough to see 6 low-profile spikes that will keep you stable on any golf course, even a really wet one. If you are a skilled golf player, you know well that comfortable shoes are essential for a successful game. 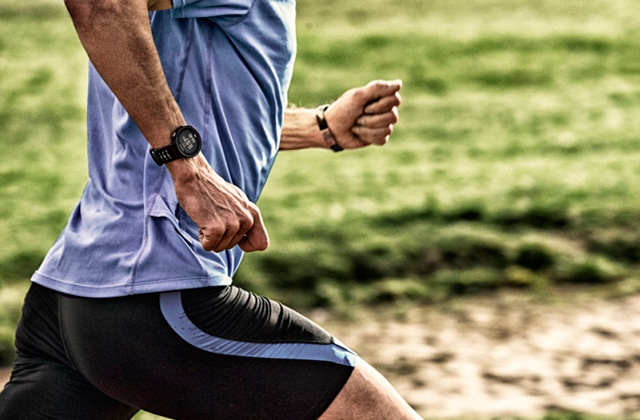 To find your way around the largest golf courses, do not forget using a golf GPS. 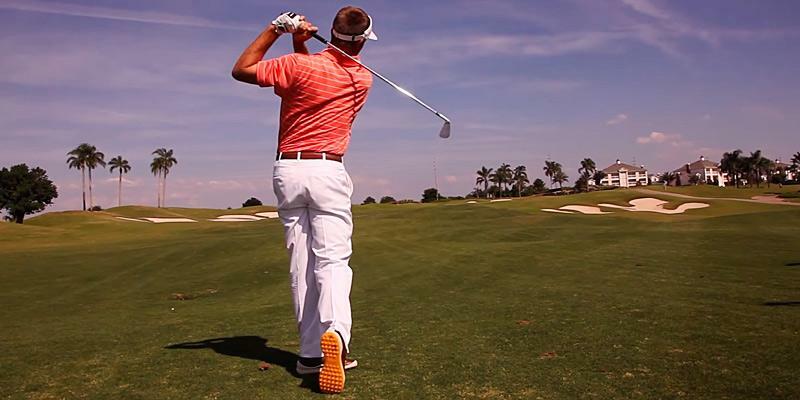 A golf player needs to cover quite large distances between swings, which is not easy for feet. Therefore, golf shoes must be highly comfortable and soft in order to prevent leg pain. 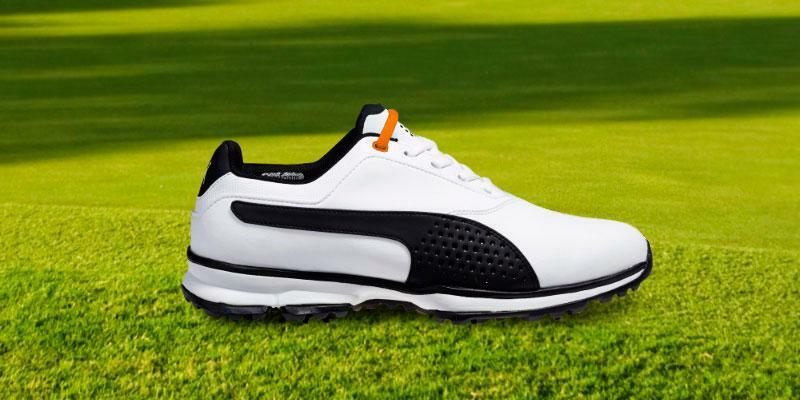 Thousands of golf players all over the world give their preference to the Puma TITANLITE shoes. The TITANLITE series is an evolution of Puma's preceding TITANTOUR series. Preserving the outstanding design and functionality, the TITANLITE golf shoes are way more lightweight, thus, more comfortable for golfers. Therefore, we can recommend these golf shoes to players of any level - from amateurs to high-ranking professionals. 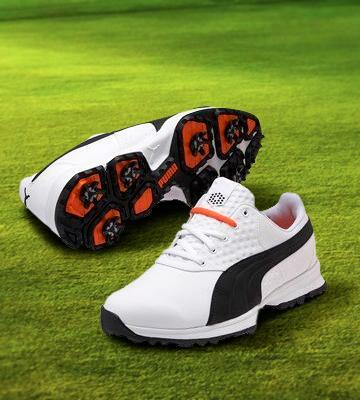 The upper part of these Puma golf shoes is made of microfibre synthetic leather with Outlast® temperature control technology. Though being synthetic, this leather is breathable and ensures the comfort of your feet. Moreover, the golf shoes have a textile lining. 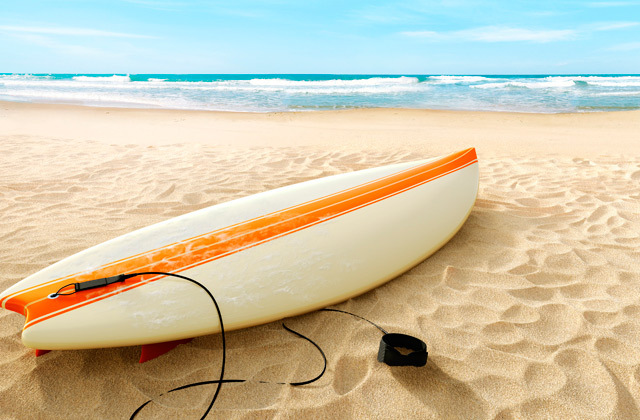 As for the sole, it is made of a lightweight foam; this material is soft, flexible, and shock-absorbing. 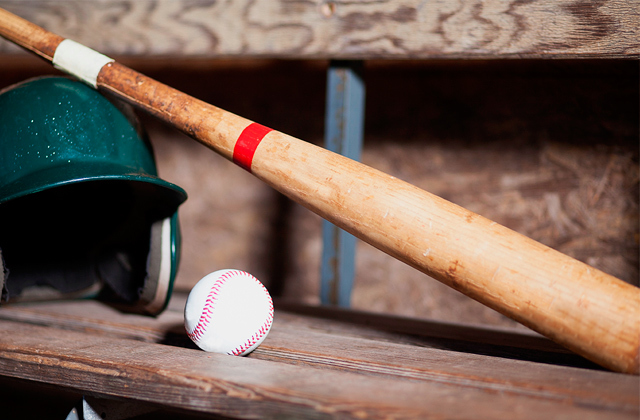 No pain or discomfort feeling will ever draw your attention off the game. As for traction, it is beyond all praise as the sole has flex grooves and 6 low-profile spikes that are strategically placed on the sole in order to maximise the contact with the ground. Wearing the TITANLITE golf shoes from Puma, you will never slip on the grass during a record-breaking swing. 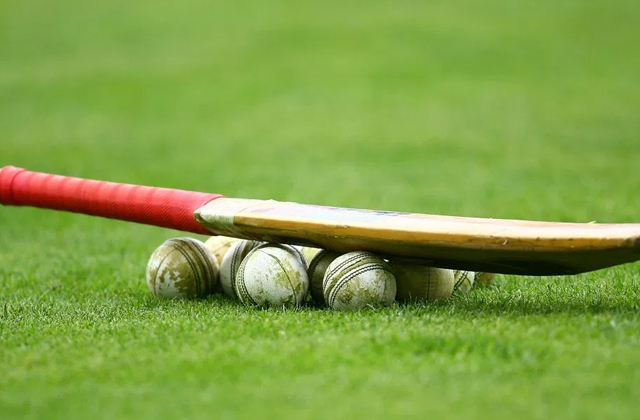 Wearing the best pair of shoes is not enough for a successful game. We recommend you to take a responsible approach of a golf putter! Visually golf shoes look like casual or fashionable footwear but after playing a round of golf in usual shoes or sneakers, you may be surprised to find out the damage they cause. In special golf shoes, you can easily spend hours on the golf course and feel no discomfort at all. Golf shoes also help you keep the balance while swinging and prevent slipping on the grass. 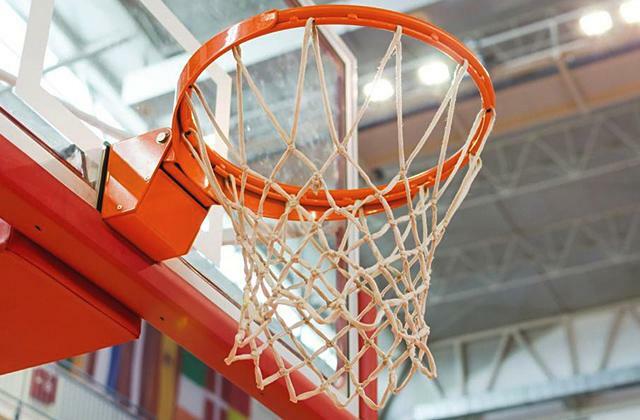 The right shoes will not only make the game more successful but enjoyable as well. If you need to take your shoes with you, gym bags will come in handy. They will also be helpful if you go on a picnic. Choosing the best shoes for golf, you should pay attention to the Material they are made of. 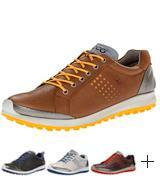 Of course, men's golf shoes from leather are more durable and weatherproof. They are also far more convenient to wear. 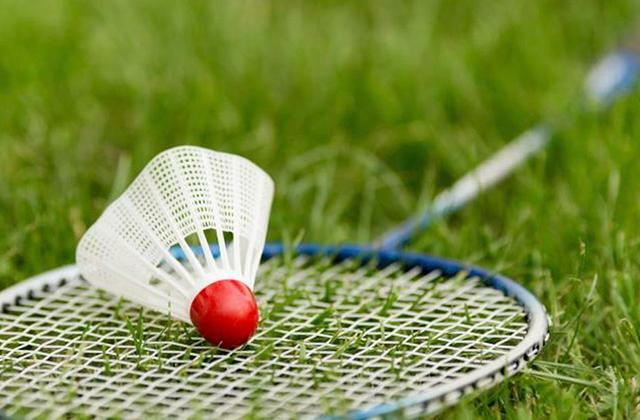 However, models made of synthetic materials are easier to clean and more lightweight compared to leather pairs, thus, more suitable for long-term games. The second significant feature of golf shoes is the material of a Sole. Most shoes have a rubber sole that is perfect for feeling stable on grassy slopes of any golf course. 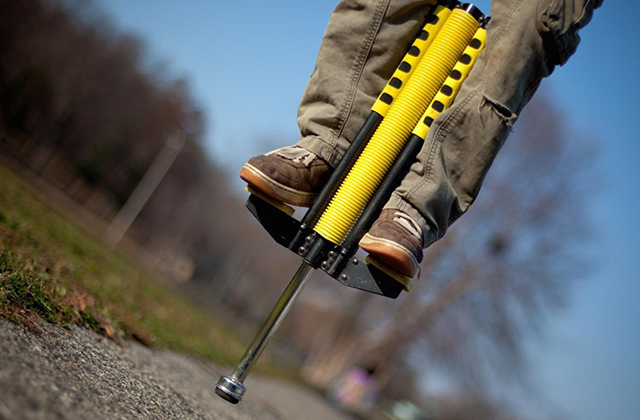 Rubber easily conforms to the shape of your foot and follows the movements precisely. 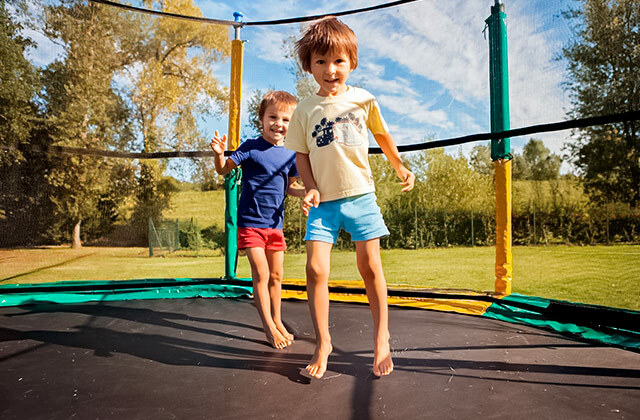 Moreover, it does not slip on the grass so you can play in any weather. 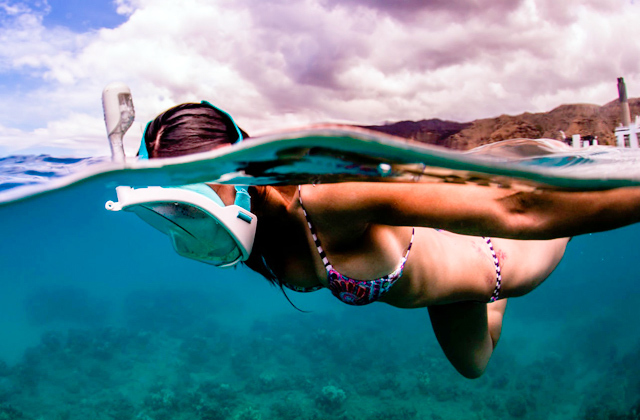 Some soles have spikes, made of either plastic or rubber. Their main duty is to ensure stability and balance on the course. On the contrary, spikeless golf shoes are more lightweight and more convenient. No need to replace the spikes, just take care of the rubber sole. The Convenience of the shoes is primarily determined by their breathability and water resistance. If you often play in rainy weather, you will surely want to protect your feet from moisture. The shoes should also "breathe" in order to prevent the accumulation of moisture inside. This is where it may be a good idea to look for a pair of shoes with mesh inserts. If your golf shoes are too tight, eventually they will start to rub and affect the game. Poor results of a golf round may also be caused by too large shoes. As you can see, you should wear golf shoes of the right size to avoid injuries. 1. How to Choose Golf Shoes, Golfsmith. 2. How to Choose Comfortable Golf Shoes, wikiHow. 3. How to Choose Golf Shoes, Golf-info-guide. 4. Golf Shoes Buying Guide, Golfalot. 5. Golf Equipment, Wikipedia. July 10, 2016. 6. Most Important Things to Consider when Buying Golf Shoes, eBay. March 3, 2016. 7. 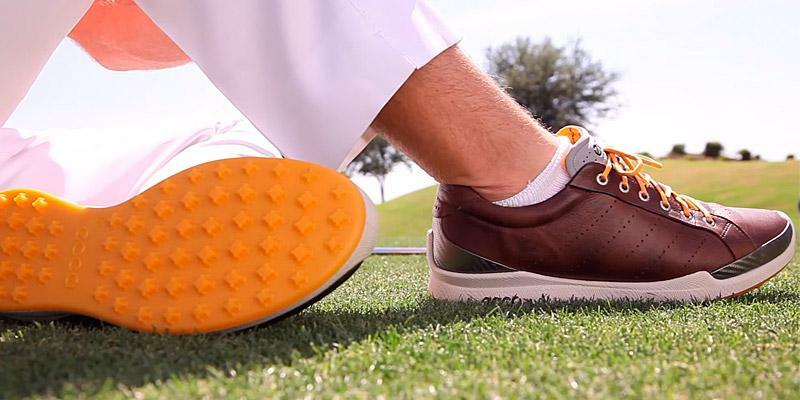 A Golf Enthusiast's Guide to the Best Shoes for Any Course, Business Insider. January 6, 2016. 8. James Roland The History of Golf Shoes, GolfLink.